The Transform Awards is North America’s only dedicated celebration of rebranding, repositioning and brand development. Jefferson (Philadelphia University + Thomas Jefferson University) has earned four major awards for the branding of the new University at the Transform Awards North America. 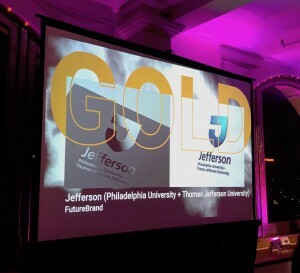 In partnership with FutureBrand, Jefferson won Best Corporate Rebrand After a Merger or Acquisition, Best Brand Evolution, Best Visual Identity from the Education Sector, and most notably, the Grand Prix for best of show going up against top brands like Intel, Coach, Konica and University of Colorado, to name a few. The Transform Awards is North America’s only dedicated celebration of rebranding, repositioning and brand development. Judges came from Amazon, Dow Jones, New York Life and more. Earlier this year, the new Jefferson brand received major awards from the international Rebrand 100 Awards, the CUPPIE Awards and the Collegiate Advertising Awards.